Almonds, Latin name Prunusdulcis, are known to be one of the healthiest foods in the world, and they are extremely popular because of a positive and beneficial effect on our health. Besides being used as a food, these nuts are also known for almond water, milk and widely known almond oil for face, hair and skin. It is repeatedly used in the cosmetics industry, and it is therefore found in many popular products and preparations for body care. Almond oil is made from the dried seeds of this plant using cold pressing and can be used as such or as part of a number of preparations in combination with other substances. More about creating, using and medicinal properties of almond oil read bellow. This nuts can be eaten fresh, and are very tasty, and when fried they can be classified as healthy snack. The Almond Tree originates from the Middle East, from where it spread to whole Mediterranean, but also to Persia and India. Its tree is extremely high and relatively narrow, and the leaves look very similar to peaches. Almond fruit is green in the beginning, but over time due to effects of the sun turns red. The outer part of the fruit is not edible nor useful, while the inside contains a seed which is a miracle of nature. In 100 grams of almonds there is 578 calories, then 21.3 percent of protein, 50 percent of fat and 19.7 percent of carbohydrates. This small but powerful seed is an excellent source of healthy substances and vitamins, but in the natural cosmetics especially appreciated is almond oil for face wrinkles and acne. Apart from protein and fat, almonds are rich in minerals that help the proper functioning of the brain and the development of nerve cells. Therefore, paediatricians often recommend that children consume these seeds, a mother can make almond water that children will drink rather than ordinary one. This is achieved by inserting few seeds into a bottle of water and leaving it overnight and during the day can be consumed in unlimited quantities. Since it is rich in phosphorus, it is recommended that children eat it because it helps proper growth of bones and teeth. How good are almonds for health? In many cultures throughout Asia for centuries almond oil, seeds and almond water were used for better concentration and memory. It has been shown that the consumption of water and seeds every morning enhances cognitive abilities, but also contributes to the better health of our nervous system. People suffering from high cholesterol are also advised to drink the prepared almond water, because its regular consumption helps increase good (HDL) and lowers bad (LDL) cholesterol. In addition, healthy fats which are in abound quantities in almond, are essential for the proper functioning of the heart. Monounsaturated fats and potassium are present in this seed in significant amounts, as well vitamin E which is a powerful antioxidant. It is therefore recommended to people who have heart diseases or have an inborn risk of developing cardiovascular disease. Almond oil for face is pale yellow in colour, and is obtained from almond seeds, and comes in two forms: as a sweet or bitter, depending on the seed. Most popular is sweet, because of its pleasant smell and taste, but mostly because of its healing properties. As such, it is most often used in aromatherapy, has excellent anti-allergic properties, and is present in the preparations for better hair growth and against the cracked skin. A major advantage is the fact that it is suitable for most skin types, because it is in preparations for the care of babies, children, and adults. Companies engaged in the production of cosmetic products for skin care have recognized almond oil and its positive impacts and implement it in its creams, ointments and masks. It is an important part of these products due to the fact that it primarily contains a lot of vitamins that are necessary for human skin to keep it healthy and maintain its optimal state. The most common are vitamins E and D, and also it has a high level of oleic acid and linoleic acid. 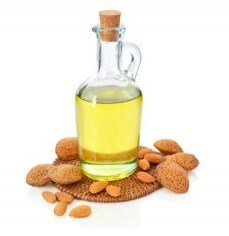 Since it contains vitamin A, almond oil for face helps reduce acne and prevents their recurrence. This volatile mixture is extremely rich in antioxidants, healthy fats and proteins, and as such can be used as a food additive. Daily use of this product can be of great help in the fight against a number of skin diseases, but also to solve a variety of problems with the hair. If you have problems with dry skin, use almond oil. It is interesting that in this case it can be combined with castor oil or rose oil, but if you have symptoms of increased greasiness of the skin, then you can use it together with hazelnut oil or yang. The great advantage of almond oil is that it suits all skin types and is a great basis for the daily care and protection. The application of almond oil is very useful for peeling the skin, because it contains natural salt and sugar and in combination with the essential preparation is extremely efficient in cleaning the pores of the face, moisturizes and allows the skin to regain its natural shine and colour. The results are visible if you use almond oil for face only once a week. After each use, it is necessary to wash with warm water. It is important to note that people with sensitive skin who have allergic reactions to oils, as well as problems with facial skin, acne scars and the like should consult a dermatologist prior to use. Almond oil for face wrinkles can be used to massage the skin in the area around the eyes, forehead, cheeks and chin, where they most often occur. The best time for this kind of treatment is before sleep. Applying this mixture to the desired areas and massage gently with circular movements of fingers. This ensures that the amount of oil that you rubbed remains on facial skin long enough to thoroughly and evenly be absorbed. This removes dead cells, improves skin texture and avoids its peeling. Massaging the face with almond oil is recommended after prolonged sun exposure, because it calms possible burns and redness caused by sunbathing. In addition, wrinkles will subside, but it can be said that almond oil for face prevents aging and is a true natural anti-aging product. There are many cosmetic products that contain this precious oil, which is used to remove dark circles under the eyes. Let’s say that the cream of almonds for the face is very good against the dark circles, but also is very expensive. If these solutions are expensive, we advise you to use natural almond oil for your face, because it is equally effective and does not contain any additional substances that could possibly irritate skin. In this article you can find a recipe on how to make the oil, and how to prepare the product that can be used as a lubricant to be gently rubbed under the eyes to solve dark circles. Optimal results of this treatment are visible if you do it every day for a period of one month. Not only will it get rid of dark circles under the eyes, the skin in that area will be softer, more toned and brighter. Ladies will especially like the use of almond oil for beautiful eyelashes. If your mascara and other cosmetics have become expensive, and you want to avoid their use because of a variety of chemicals and try something natural, then we advise you to try this little trick. Before sleep it is necessary to remove all makeup from the face and to wash with neutral soap and warm water. It is important to do this thoroughly as possible because remains of makeup can get into the eyes and irritate them. Then almond oil is applied, two to three drops, and are gently rubbed on the eyelids at the root of the eyelashes and left overnight to operate. If you want, you can use a brush on the eyelashes by dipping it in oil and applying it as a mascara. The next morning, take a gauze moistened with water and gently dab the eyelids to remove any residual oil. Since the regular cycle of eyelashes growth is about two months, the results of this treatment are visible after this period, as they become thicker and longer, and it is advisable that you continue every day to use almond oil for eyelashes. Almond oil against stretch marks is very effective, because it tightens the skin and provides better blood circulation which can reduce and eventually alleviate these side effects on the skin. It is especially recommended for pregnant women, so that after every shower you oil places where stretch marks are and rub in a circular motion. The almond oil needs more time to be absorbed in the skin, but it can be combined with regular moisturizer. We must draw attention to the fact that the appearance of stretch marks depends on the type of the skin and its elasticity, and in order to alleviate or eliminate their formation at least 8 glasses of water a day should be consumed every day. Almond oil against stretch marks during pregnancy is effective when applied locally, and it can of course be used as a supplement to other dishes. The skin rash is caused by a variety of irritation or inflammation. For example, it is common in infants due to wearing diapers. On the other hand, in adults it occurs due to wearing inappropriate clothing, excessive sweating, poor deodorant, etc. Usually we first remember to look for some creams from known manufacturers, but doctors still advise to use almond oil against rash first. First of all, because you will not be exposed to the risk to further irritate the skin with various chemicals, but will calm down and give it all the necessary vitamins and minerals that will be beneficial to it. It is sufficient to use this product once a day, by dipping two fingers in almond oil and gently tapping the area that is irritated and gently rub it. Almost immediately you will feel that it begins to work and you feel less and less irritation. You need to let it be absorbed in the skin, and a rash will withdraw after a few days. Due to stress, poor nutrition, and various environmental factors, it may happen that your hair starts to decline and the new one is growing slower. Many products used for hair growth are expensive, and also contain a lot of chemicals that cause irritation and other side effects. To prevent this, use almond oil for hair, as this will naturally keep the hair root and the necessary amount of magnesium and zinc which this product is rich in. Almond oil needs to be used every night after showering, one tablespoon of oil rub in a circular motion with fingers into the scalp. It is important that you do it gently in order to avoid cracking of hair at the root. After that, leave it overnight for scalp to absorb all the oil, and in the morning you can rinse it with lukewarm water. You will notice that the hair is softer, shinier and stronger. If you want to increase these effects, use almond oil as an addition to salads and your body will absorb all the minerals and vitamins from it, and you will be satisfied with the results after a few weeks. When we know how good almond oil is for face, hair, skin, eyelashes and stretch marks, we should also say that it turned out as a very effective tool against cracking nails. As a result of mineral and vitamin deficiency or insufficient intake of vitamins and minerals in the body, white spots appear on the nails, and often they crack and are weak. What you need is a regular treatment with almond oil, because it is rich in zinc, which is very good for your nails. The problem is easily solved, and all you have to do is dip your toes and fingers in the oil, and then with gentle circular motions coat polish and rub well into the root of the nail. You will also be freed of the cuticle, and thickening of nails. If you cannot find this product on sale, you can easily create it at your home. You need to get a fresh almond and olive oil. To begin with, in a blender pour 2 cups of fresh almonds. Mix at low speed, in order for seeds to be equally cut up and began to release their natural oil. If you notice that a greater amount of mass accumulates on the side, stop the blender and spoon them back on the blade. This will probably have to be repeated several times during the process, which is common and you do not have to worry about it. After that, you can increase the speed of chopping, and you will notice that the weight becomes more balanced, it is time to add 2 teaspoons of olive oil. Finally, use a sieve to squeeze oil from one jar to another. Mixture that is left after the process you do not have to throw away, but you can use it in cooking as a seasoning, or to use it as a spread for toast. What is the price of almond oil in pharmacies? Almond oil for the face contains essential vitamins for skin health and beauty. For this reason, it is present in almost all cosmetic products on the market that are used for face and skin in general. In a separate sale you can find it in well stocked health food stores or on the Internet. Price ranges from 3 dollars for up to 50 ml, depending on the amount of packaging and producer. If you think the price is high or you cannot find it, you can make almond oil at your home. The price of 100 grams of almonds is around 7 dollars, and you can get it in larger supermarkets in bulk. Almond oil for the face can be used as a mask. This product is known for its easy removal of all impurities and dead cells from the skin of the face, caused due to the influence of external factors such as pollution, dirt, dust, sweat etc. Since it easily penetrates the pores of the skin, it removes acne, pimples and blackheads and prevents their appearance. 1 tablespoon of lemon juice (drained). Mix all the ingredients well to form a paste like mixture. Then with fingers, apply on your face as you do with the cream. Be careful to avoid eye contact. It is best to apply the mask in the morning or at bedtime, and you need to leave it on at least 30 minutes after which it is enough to wash it with warm water.